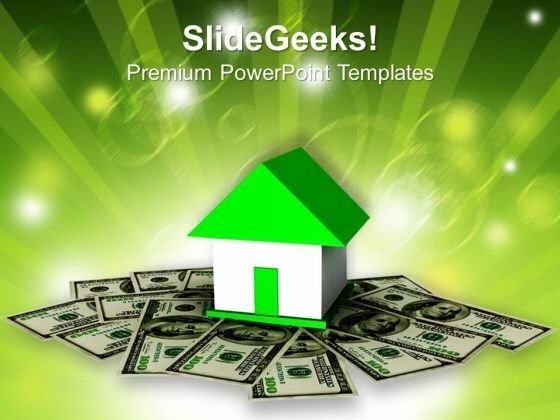 Home Loan Money Business PowerPoint Templates And PowerPoint Themes 1012-This template with an image of Dollar Bills under the house illustrated in the Aligned manner helps you chart the course of your presentation. This Template signifies the investment Concept. The Dollar Bills are placed in 3D manner. You have what it takes to grow. Take your team along by explaining your plans.-Home Loan Money Business PowerPoint Templates And PowerPoint Themes 1012-This PowerPoint template can be used for presentations relating to-"House On Money Stack, Business, Sales, Real Estate, Finance, Money" Our Home Loan Money Business PowerPoint Templates And PowerPoint Themes 1012 will ensure your ideas are approved. You will be glad you tried us out. Improve the visual apprearance of your presentation with our Home Loan Money Business PowerPoint Templates And PowerPoint Themes 1012. Make sure your presentation gets the attention it deserves.